We’re still in the middle of public consultations on what seems like every domain of policy for the federal government, and that includes cultural policy. Canadian culture has a fascinating history, particularly as seen through various efforts over the years to shape, manage, and protect it. Before the Second World War, English Canada’s cultural identity was lodged firmly in the British Empire, and efforts to shape culture were targeted at groups who didn’t fit the mold, like First Nations. During and after the war, the state became involved in creating a national identity and a distinctly Canadian national culture, independent of Britain, and often in opposition to the cultural threat posed by the media industries of the United States. A variety of institutions were directed to this task, including the NFB, CBC, Canada Council for the Arts, CRTC, and the complex set of agencies that administer what we might call the Canadian content (CanCon) regime (though calling it a regime might suggest more coherence than is actually the case). By the time the twentieth century ended, and the internet was opened to the public, efforts to actively shape Canadian culture into some prescribed form had largely been abandoned. Instead of creating a particular national identity, or telling a national narrative, the concern shifted to supporting CanCon creators and ‘telling Canadian stories’, whether those stories were Trailer Park Boys or Anne of Green Gables. However, this meant that justifications for government’s role in promoting Canadian culture were often on fairly thin grounds — attracting or retaining cultural industries, or making sure the characters we saw in popular culture were ones we could relate to. In the 1990s, sweeping discussions of internet policy (such as the Information Highway Advisory Council reports) were still based on the assumptions of cultural protectionism — that we should find ways to promote and protect Canadian culture on the “information highway”, since international media flows were a threat to cultural sovereignty. In the end (and unsurprisingly given its composition), IHAC ended up divided on this topic, and didn’t support an ISP tax or any radical measures like a cultural firewall in its final report. Subsequent discussions of online cultural policy have been more limited, including debates over tariffs, copyright legislation or how the CRTC should classify over-the-top services like Netflix. Online services have largely avoided being subject to CanCon regulation, and according to Canada’s pollsters, the country’s population isn’t keen to change this (and this is especially true for people under 35). We’ve gotten quite used to our tax-free Netflix, and extending the scope of internet regulation is not an easy sell. I think many Canadians have no idea this whole world of content regulation even exists — I certainly had no clue until I started volunteering at the campus radio station, and even then it’s not like anyone sat me down to explain the purpose of this system. Canadian culture, like telecom, is a domain of public policy that is governed by several (sometimes overlapping) federal departments. The Department of Canadian Heritage is largely responsible for culture, but the CRTC regulates telecom and broadcasting in Canada, administering their respective acts. This puts the Commission in charge of two rather different sets of priorities for what is often the same media infrastructure, one of which includes cultural promotion and protection. In an age when telecom meant telephones, and broadcasting meant television and radio, the two really did appear to be distinct categories, but that appearance has faded, and so there have been numerous calls to somehow revise or consolidate these mandates. As former CRTC Commissioner Denton writes, there is a contradiction between the two statues: “The Broadcasting Act says ‘go forth and discriminate in favour of Canadian programming’. The Telecommunications Act says ‘thou shalt not discriminate among signals except for very good reason'”. One ensures that intermediaries do not give preferential treatment to content without good reason, while the other sustains the privilege of a particular class of content — Canadian content (CanCon). Integrating cultural and telecom policy would be no easy feat, and bring about some dramatic changes depending on what we wanted to prioritize. CanCon requirements were recently lessened and focused for broadcasters, and there has been no extension of these obligations for online providers. The spectre of such a move (presented by critics as a ‘Netflix tax’) is something politicians have generally fought against in this country rather than championed. 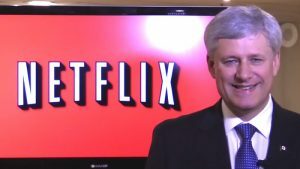 In the last federal election Stephen Harper presented himself as just a regular, Netflix-loving dude, and also the only thing standing between Canadians and higher monthly bills. 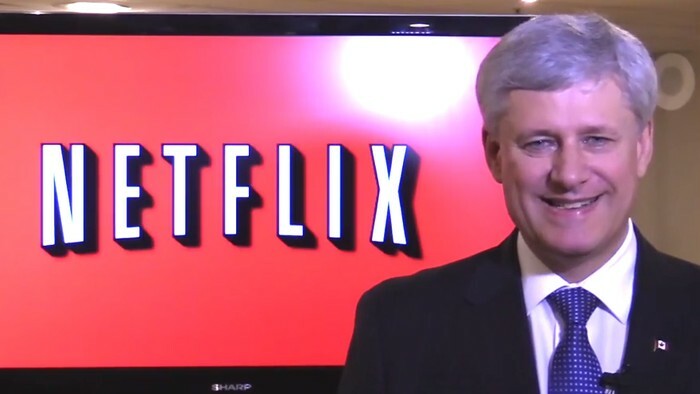 Under the Harper government, it was clear that the CRTC was powerless to go after Netflix even if they had wanted to. When the company defied the Commission in 2014, all Chairman Blais could do was act upset and offended, with Netflix effectively calling his formal authority a bluff. The Liberals have yet to fulfil the Harper prophecy of regulating Netflix, but Canadian media has recently been open to public consultation (and some quasi-public discussions), with our Heritage Minister declaring that “everything is on the table“. In general, the government might choose to extend Canadian cultural policy online, or it might pull back the CanCon regime. We might even see a bit of both, but definitely not extending to some sort of cultural firewall around a sovereign Canadian internet. The Government of Canada recognizes that “The way forward is not attempting to regulate content on the Internet“, and consultations are focused on how to support the production of Canadian culture in a “digital world”, with the real questions being who will benefit from this support, and how we are going to fund it. Personally, I’m not opposed to public funding for culture, but I also don’t see it as a requirement in many cases. I value broadcasters like the CBC for helping me understand Canadian society, primarily through news and documentary rather than dramatic or comedy series (in that respect there isn’t much of CBC TV that I would be sad to see go, while there are still a number of good radio programs). Many kinds of art are not capital-intensive, and will be produced whether or not there are government programs in place. The fact that I came up in a thriving Canadian music culture operating largely independent of copyright or cultural funding no doubt shapes my thinking in this regard (a story I might share another time). The nightmare scenario for me is not about losing out to other cultural markets, fewer jobs in Canada’s cultural industries, or artists no longer being able to sustain careers as they once were. Culture is dynamic, and the most exciting forms come from below rather than top-down. Cultural protectionism makes the most sense if we think of culture as expensive mass media, individuals as consumers of culture, and U.S. cultural industries as a threat to Canada’s cultural sovereignty. But artists will make art everywhere, some of these artists will be Canadian, and we may or may not end up with some sense of Canadian identity as a result. I am more worried about the possibility that living in an information-rich world will also mean being ignorant about local events, and no one being rewarded for answering the sorts of questions that powerful interests in this country would rather not hear asked. Perhaps a public broadcaster can be well-resourced and independent enough to play this role, but in an ideal world this wouldn’t just be the CBC’s responsibility. I rely on journalism and related media that tell me what is happening in the world in order to actively participate in democracy. I rely on it to do my job (which often involves classroom discussions of Canadian society). I can do without other kinds of CanCon. I’m also in support of public funding for indigenous cultural programs. For most of Canada’s history the state has tried to eradicate indigenous culture, systematically resocializing children in residential schools, banning ceremonies, leaving behind broken communities and cultural dead-ends. The damage done by this cultural policy is hard to calculate but still ongoing. Its victims include young indigenous people who are unable to situate themselves in Canadian society because it does not speak to them, but also lack a cultural understanding of their own because it has been extinguished in previous generations. Some of this damage is irreversible, but in many cases knowledge, practices, culture can be recovered, preserved, and kept alive. The least a Canadian cultural policy could do is to try to address some of these wrongs and support efforts within First Nations communities to meet these cultural needs. These are my opinions, so let the government know what you think before November 25. Otherwise, the voices that may be heard loudest are the ones that are most invested in the existing (and often declining) regime of cultural production.